Known as the “mother of all grains” by the ancient Incas, quinoa (pronounced “keen-wah”) is actually a seed and one of the few plant-based sources of complete protein with 8 grams of protein per cooked cup. Considered by many experts as a “super-grain,” quinoa is packed with nutrients and is gluten free, making it a safe alternative for those who are unable to tolerate more common grains. So how can you use this 5,000-year-old South American staple in your cooking? This protein packed breakfast combines quinoa with Southwestern flavors like avocado, tomato, corn, and cilantro. Make as-is or experiment with additional ingredients like radishes, black beans, or cucumber. Top your creation with your favorite hot sauce for some added heat. Looking for a protein packed alternative to oatmeal? 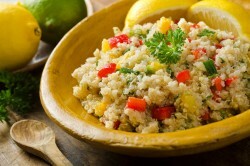 Quinoa is a popular hot breakfast cereal in Bolivia where the seed is native. Blended with chai inspired spices like cinnamon, nutmeg, and ginger. This is a flavorful way to start the day. Inspired by Mexican cuisine, this nutritious recipe is packed with flavor and is easily portable, making it a perfect lunch choice. This recipe is packed with vegetables and can be catered to your taste. Try cucumbers in place of carrots or you can add some fruit into the mix. Quinoa adds texture and the benefit of whole grains to this heart-healthy chicken and vegetable soup. Ready in as few as 15 minutes, this low calorie soup serves as the perfect lunch on a cold day. Full of flavor and color, this recipe serves up a juicy grilled chicken breast infused with flavors of lemon and basil, on a nest of avocados, bell peppers, and red quinoa. Balance the meal with some orange slices and a glass of milk, and you’ll have a complete and satisfying dinner. Quinoa doesn’t have to only be enjoyed in its traditional seed form. These days, many food companies are using quinoa as the base of their products. For instance, this recipe calls for quinoa spaghetti noodles to create a delicious pasta dish with a little kick. These are just a few examples of cooking with quinoa. This ancient grain has made its mark on the nutrition world, and chefs and households around the world are looking for new ways to integrate it into their dishes. Looking for other superfoods to try? Here are a few other superfoods you can grow at home!